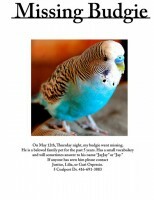 JayJay is a small, blue black and white budgie. He is very friendly and repsonds to his name ” Jay” or “JayJay”. He has a vocabulary of about 20 words.